NASA's Galaxy Evolution Explorer found a tail behind a galaxy called IC 3418. The star-studded tail can be seen as detected by the space telescope in ultraviolet light. The tail has escaped detection in visible light. Full Story. A cosmichit-and-run between two speeding galaxies has left one with a wispy tailspeckled with stars, according to a new snapshot from a NASA space observatory. The newgalaxy tail photo reveals the aftermath of a collision between the galaxy IC3418 and a member of its neighboring Virgo galaxy cluster. The galacticsmash-up occurred 54 million light-years from Earth and was spotted by NASA's GalaxyEvolution Explorer (GALEX) observatory. These new observations from GALEXwill help give astronomers a better understanding of how stars form,researchers said. "Thegas in this galaxy is being blown back into a turbulent wake," said JaniceHester of the California Institute of Technology in Pasadena, Calif., leadauthor of a recent study that was published in the Astrophysical JournalLetters. But starsstill manage to form despite rough conditions in the galaxy's tail, which stemsfrom a mix of stellar winds and interstellar gas, Hester added. "Thegas is like sand caught up by a stiff wind," she explained. "However,the particular type of gas that is needed to make stars is heavier, like pebbles,and can't be blown out of the galaxy. The new Galaxy Evolution Explorerobservations are teaching us that this heavier, star-forming gas can form inthe wake, possibly in swirling eddies of gas." Galaxycollisions are not uncommon in the universe. In fact, it is estimated thatour own Milky Way galaxy will eventually crash into the Andromeda galaxy in afew billion years. 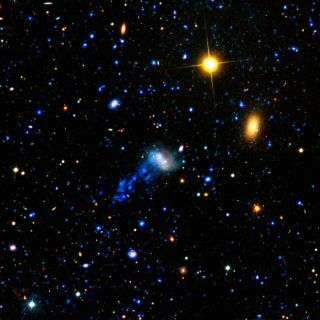 Galaxies canbecome tangled together, kicking gas and dust into space around them. Thegalaxies that emerge from these tussles a little worse for wear are left withtails of material stripped off during their violent encounters. Hester and ateam of astronomers closely examined the tail of IC 3418, which actually formedin a very different way. Instead of bumping up against one galaxy, IC 3418 ismingling with the entire Virgo cluster of galaxies. This massivegalaxycluster ? which contains approximately 1,500 galaxies and is permeated byhot gas ? is pulling IC3418 in, causing it to plunge through the cluster's gasat a blistering rate of over 2 million mph (3.2 million kph). At thisextraordinary speed, IC 3418's gas is being shoved back into the choppy tailthat is visible in the new image. The researchers were able to track the galactic tail of IC 3418 using GALEX,which observes the universe in ultraviolet wavelengths in order to measure thehistory of star formation. The tail is studded with clusters of massive, youngstars that glow with ultraviolet light that is easily spotted by the GALEXspace telescope. The tail's youngstars indicate that a crucial ingredient for star formation ? dense clouds ofgas called molecular hydrogen ? formed in the wake of IC 3418's galactic plunge. This is thefirst time astronomers have found solid evidence that clouds of molecularhydrogen can form under the violent conditions present in a turbulent wake,researchers said. "IC3418's tail of star-formation demonstrates that strong turbulence promotescloud formation," said Mark Seibert, a co-author of the paper and a memberof the Galaxy Evolution Explorer science team at the Carnegie Observatories in Pasadena. Galaxy tailsprovide an ideal environment for isolating the factors that control starformation, said Hester. "Thesetails are unique, exotic locations where we can probe the precise mechanismsbehind star formation," she said. "Understanding star formation ispivotal to understanding the lifecycles of galaxies and the dramatictransformations that some galaxies undergo. We can also study how the processaffects the development of planets like our own." The GalaxyEvolution Explorer mission aims to better understand the formationof galaxies. Since its launch in 2003, GALEX has imaged over a half-billionobjects across two-thirds of the sky.